You know those big soft buttery pretzels that you get at the mall? There is no need to travel through the masses of people to get one of these warm beauties. The kids love them! *Use the greater amount in the winter, the lesser amount in the summer, and somewhere in between in the spring and fall. Your goal is a soft dough. Food processor method: Place the flour, salt, sugar and yeast in the work bowl of a food processor equipped with the steel blade. Process for 5 seconds. Add the water, and process for 7 to 10 seconds, until the dough starts to clear the sides of the bowl. Process a further 45 seconds. Place a handful of flour in a bowl, scoop the slack dough into the bowl, and shape the dough into a ball, coating it with the flour. Transfer the dough to a plastic bag, close the bag loosely, leaving room for the dough to expand, and let it rest at room temperature for 30 minutes. Bread machine method: Place all of the dough ingredients into the pan of your bread machine, program the machine for Dough or Manual, and press Start. Allow the dough to proceed through its kneading cycle (no need to let it rise), then cancel the machine, flour the dough, and give it a rest in a plastic bag, as instructed above. Manual/Mixer Method: Place all of the dough ingredients into a bowl, and beat till well-combined. Knead the dough, by hand or machine, for about 5 minutes, till it's soft, smooth, and quite slack. Flour the dough and place it in a bag, and allow it to rest for 30 minutes. Preheat your oven to 500°F. Prepare two baking sheets by spraying them with vegetable oil spray, or lining them with parchment paper. Transfer the dough to a lightly greased work surface, and divide it into eight equal pieces (about 70g, or 2 1/2 ounces, each). Allow the pieces to rest, uncovered, for 5 minutes. While the dough is resting, combine the 1/2 cup warm water and the baking soda, and place it in a shallow bowl. 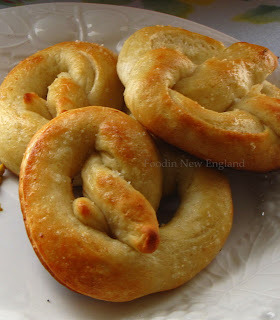 Make sure the baking soda is thoroughly dissolved; if it isn't, it'll make your pretzels splotchy. Roll each piece of dough into a long, thin rope (about 28 to 30 inches long), and twist each rope into a pretzel, as illustrated. Dip each pretzel in the baking soda wash (this will give the pretzels a nice, golden-brown color), and place them on the baking sheets. Sprinkle them lightly with coarse, kosher, or pretzel salt. Allow them to rest, uncovered, for 10 minutes. Bake the pretzels for 8 to 9 minutes, or until they're golden brown, reversing the baking sheets halfway through. Remove the pretzels from the oven, and brush them thoroughly with the melted butter. Keep brushing the butter on until you've used it all up; it may seem like a lot, but that's what gives these pretzels their ethereal taste. Eat the pretzels warm, or reheat them in an oven or microwave. Yield: 8 pretzels. Holy smokes! 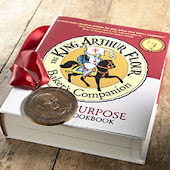 How did I miss this in my King Arthur Cookbook? These look awesome. I can almost taste it through your pic! :) Happy New Year Darlin!! To you and all of your family! Yum! thanks for this post! I have been looking for snack things to make at home that aren't necessarily sweet! This one is great for the budget, and I bet I have all these ingredients in the pantry! I would like to taste it !